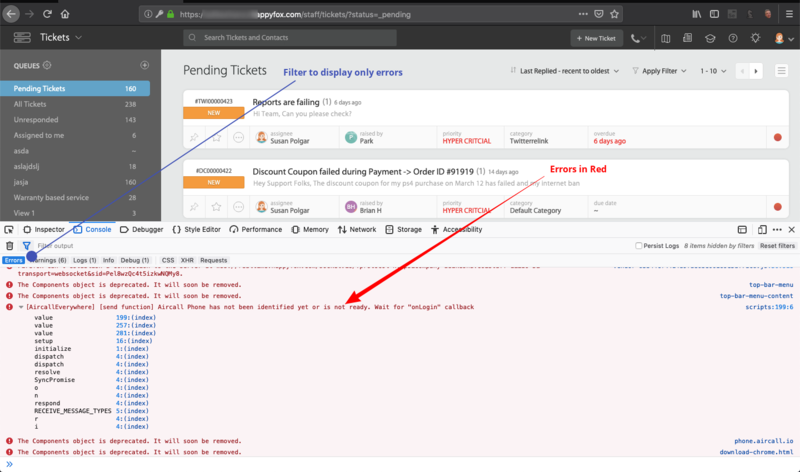 When you're reporting an issue to HappyFox support, we may ask for a screenshot of your Web Browser's Console and/or Network Logs to troubleshoot the problem thoroughly 🛠. 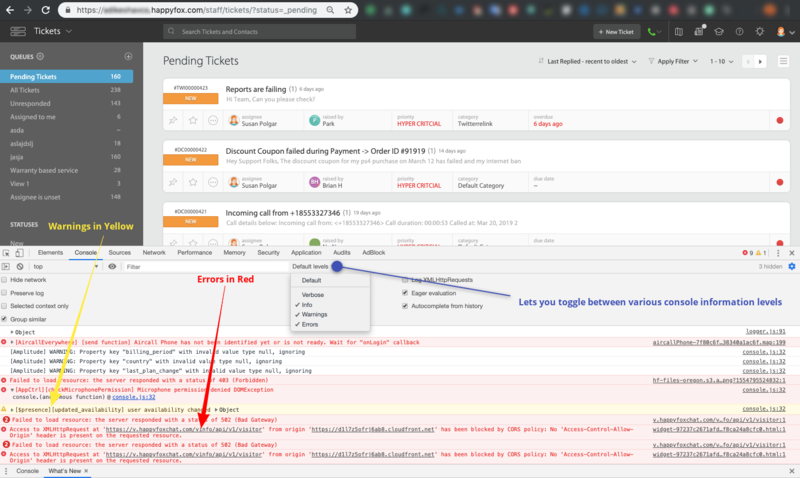 Console/Network Logs often contain important error details essential to identify the root cause of the issue/bug that you're facing inside HappyFox. In Google Chrome, the Console Logs are available as a part of Chrome Dev Tools. Press Ctrl+Shift+J (Windows / Linux) or Cmd+Opt+J (Mac). Locate and Click the "Three dots Menu bar" on the top right of your chrome browser. Go to More tools >> Developer Tools. In the Console Tab, you can find the current error messages (Displayed in Red) along with other console level information such as warnings and info. Tip 💡: If your bug/issue involves movement across multiple pages of the app, it is recommended to "Preserve Log". This helps to persist the error messages. In general, Network panel is used when you need to make sure that resources are being downloaded or uploaded as expected. Open DevTools by pressing Control+Shift+I or Command+Option+I (Mac). Refresh the contents of the webpage. Alert❗️: It is important to open the Network Tab before performing any action that results in an issue. This is done to properly preserve the network traffic data, one among which could be the error. Alternatively, Reload the page to start getting the logs. Click on the error to find the error details. 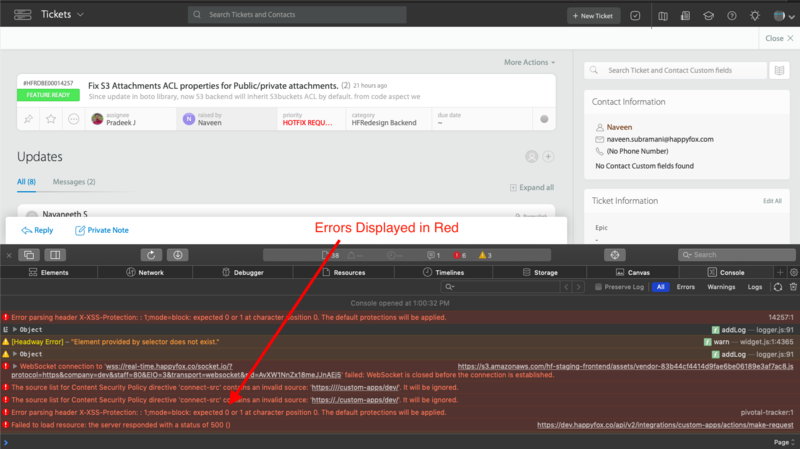 Navigate across Header, Preview and Response tabs to know more about the error and its origin. Header tab may contain critical information related to the error. Please check with your designated support representative to know which information to share. In Mozilla FireFox, the Console Logs are available as a part of FireFox developer tools. or press the Ctrl+Shift+K (Command+Option+K on OS X) keyboard shortcut. Press Ctrl + Shift + E ( Command + Option + E on a Mac). Select "Network" from the Web Developer menu, (which is a submenu of the Tools menu on OS X and Linux). Click the wrench icon, which is in the main toolbar or under the Hamburger menu, then select "Network". Alert❗️: It is important to open the Network Tab before performing any action that results in an issue. This is done to properly preserve the network traffic data, one among which could be the error. Click on the error to find the error details. Navigate across Header, Params and Response tabs to know more about the error and its origin. Header tab may contain critical information related to the error. Please check with your designated support representative to know which information to share. Go to Safari >> Preferences >> Advanced (From the header). Enable "Show Develop Menu in Menu Bar". Errors are displayed in "Red" font. Clicking on the error would open the details area. You can find critical error information in the header and Preview tabs. How to reduce the Time Spent that was added in a ticket?